Not to be seen alone, in my case, completely so! It’s spring break week at my university, and I’ve been using the time to get caught up on a variety of writing projects and other commitments. Yesterday I intended to dive into edits of a couple of articles I’m working on, but the university server was down and I couldn’t access the files I needed. It was St. Patrick’s Day anyway, so I figured, why not take the afternoon off? And that I did. William and Katherine lead a devout Christian life, homesteading on the edge of an impassible wilderness, with five children. When their newborn son mysteriously vanishes and their crops fail, the family begins to turn on one another. ‘The Witch’ is a chilling portrait of a family unraveling within their own fears and anxieties, leaving them prey for an inescapable evil. Pictured above are the father, William (Ralph Ineson), holding his oldest daughter, Thomasin (Anya Taylor-Joy). The cast is excellent, with Taylor-Joy delivering an especially exceptional performance. Please don’t be concerned that I was disturbing fellow movie goers by snapping that photo with my iPhone camera. You see, there was no one else in that theatre. (That’s a first for me.) Although “The Witch” has received strong reviews, it has been out for a while, and I guess St. Pat’s revelers were in no mood to watch a movie that might cause them to feel guilty about their earthly behaviors. After the movie, I walked over to the nearby Brattle Book Shop, my favorite used bookstore in the Greater Boston area, and found a few affordable goodies, including a couple of gifts for friends. I visit the Brattle at least once a month, sometimes more often. When the weather is decent, their big draw is an array of outdoor book carts in their adjoining lot, containing thousands of wonderful bargains priced at $5, $3, and $1. However, higher end collectors will also find plenty of treasures in their rare book room. Here’s a photo of an item they sold for a tidy sum. 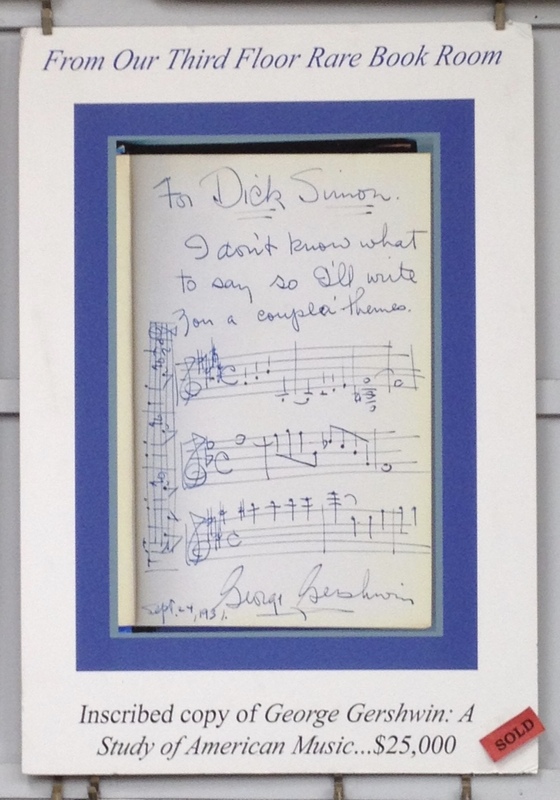 Nope, despite my love of anything Gershwin, I was not the buyer. (I’m opting to pay my mortgage this year instead.) But I did pick up a couple of songbooks with selections from that era for only five bucks a pop. Not a bad deal if I say so myself. That Gershwin collectible is amazing! And your day sounds great–there is nothing better than having good intentions but then being forced to desert them and have fun! Hi Kerry! Yes, it was a lovely day. Nothing like a tech breakdown to create an opportunity for fun!